Six self-governing Yukon First Nations are collaborating with the Yukon government to train land guardians to monitor the Southern Lakes herd. Six First Nations — Carcross/Tagish, Kwanlin Dun, the Ta'an Kwach'an Council, Taku River Tlingit, Teslin Tlingit Council, and Champagne and Aishihik — all have land guardians and monitors appointed to watch over each of their traditional territories. But now for the first time the First Nations are pooling their resources to work collaboratively to help monitor the herd, which has been the focus of recovery efforts since the 1990s. Karlie Knight is the Natural Resources Coordinator for the Carcross/Tagish First Nation government. "The management plan is the first of its kind, in the sense that it's Indigenous-led," Knight said. "We have so many different governments working together, and I mean, our actions have proven themselves, in the numbers of caribou that increased substantially — but we're still not where we were, historically." The course is for ground-based monitoring of the herd, using technology and traditional knowledge. Land guardians and monitors from the six First Nations are learning about GPS, camera traps, caribou tracks, and where the animals usually bed down in the winter months. Since 1993, conservation efforts from First Nations and the Yukon government have focused on protecting the Southern Lakes herd, which had been in decline. The herd consist of three smaller populations — the Carcross herd, the Atlin herd (which ranges into Yukon and B.C. ), and the Ibex herd. The herd has since started to rebound. Knight says the new pilot project is a collaborative effort. "Right from the get-go, it was based on traditional and local knowledge. So elders in Carcross and locals were the ones who kind of spearheaded the whole Southern Lakes Coordinating Committee, with the Yukon government," she said. "And we always take our information back to the elders and say, 'this is what you're asking us to do. Are we hearing you right?'" Students in the program are learning about caribou behaviour, and how to find the animals in their winter habitat. GPS coordinates, plus field work data, will be shared between the First Nations and Yukon government, to better track the herd. Knight says that will guide wildlife management decisions, and help create a new wildlife management plan for the Southern Lakes caribou. Brandy Mayes of the Kwanlin Dun First Nation says programs like this can help the herd rebound. 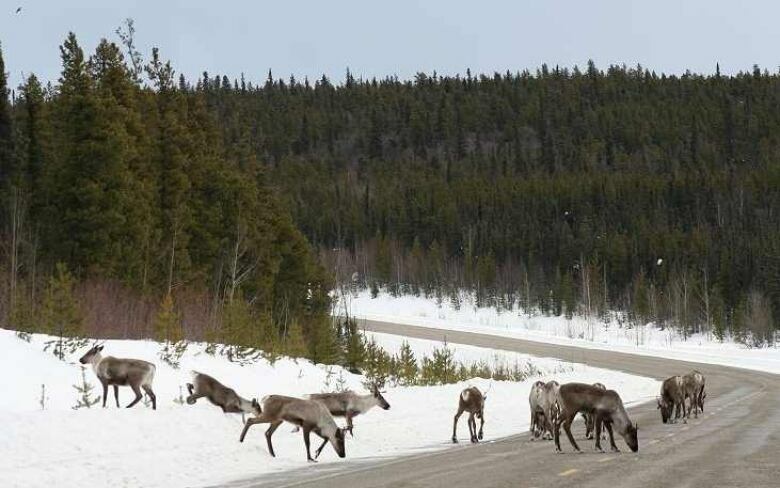 "We are really lucky here in the Southern Lakes, because of a long term initiative that's been taking place with the recovery program — that we are one of the few places in Canada that our caribou are increasing," she said. Knight says the new pilot project also offers lots of opportunity for innovation, and co-operation between governments. "This, I truly believe, is what can happen when these final [land claims] agreements are implemented," she said. "This is a shining example. We're leading the way." Mike Rudyk has worked for CBC Yukon since 1999, as a reporter and videographer. He lives in Whitehorse.